Robert Lee Hayes, also known as Bullet Bob, was an Olympic sprinter turned wide receiver in the NFL. He was a two-sport standout in college in both track and football at Florida A&M University. 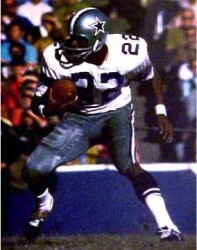 Hayes was enshrined in the Dallas Cowboys Ring of Honor in 2001 and was selected for induction in the Pro Football Hall of Fame in 2009. Hayes is the second Olympic gold medalist to be inducted to the Hall of Fame, after Jim Thorpe. Hayes is the only man to win both an Olympic gold medal and a Super Bowl ring. His career statistics in the NFL include 3 Pro Bowl selections, two First Team All-Pro Selections, 2 Second Team All-Pro Selections, 371 receptions for 7,414 yards and 71 touchdowns. In track and field, he had Olympic gold medals in the 100 meters and the 4X100 relay.